A first for the NYC-based healthcare boutique. 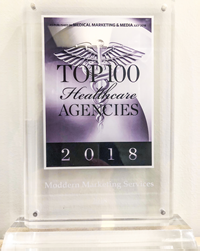 Moddern Marketing (Moddern), an award-winning independently-owned integrated marketing agency, has been honored as one of the Top 100 Healthcare Agencies in North America by Medical Marketing & Media (MM&M), one of the nation's leading business publications serving the executive healthcare market. Moddern has had a sustained run of growth in the healthcare sector since 2013, when it won its first health supplement client. Since then, the agency has added numerous national healthcare and health-related client business in medical devices, infant nutrition, advanced wound care, nerve stimulation, menopause relief, and marketing for orthopedic device distribution. moddern is especially well-versed in the spine sector and has a specialty in marketing ambulatory surgical centers. This is the first time the agency has been honored by MM&M with the Top 100 Healthcare Agencies in North America award. MM&M was first published in 1966 as Medical Marketing & Media, and today produces an essential mix of online breaking news and analysis combined with monthly print features. The content is designed for an executive audience of leaders and thinkers who work in pharma, medical devices, diagnostics, and greater healthcare marketing. Every year, the magazine produces several lists, conferences and events, and compiles an annual Agency Issue that features profiles of the top 100 healthcare marketing agencies in North America. It also runs the industry’s premier awards program, the MM&M awards, which celebrate creativity and effectiveness in healthcare marketing. Its parent company is Haymarket Media. Moddern Marketing is an integrated marketing services agency based in New York City. With roots in direct marketing, the agency is focused on delivering strategy, creative, and media services in both online and offline environments with a watchful eye on effectiveness and driving measurable results. While moddern has clients in a variety of sectors, it began focusing on healthcare in 2013, and has since recruited against that discipline, while growing its client roster.